Forget Me Not recently took in 5 mama kitties with a total of 16 babies, all from one location. Two of the mamas and one baby have already been spoken for, but we are now beginning to list the rest of the adoptable kitties. In today’s post we are introducing two of the mamas – Calandra and CaraCara – along with two of the distinct litters. 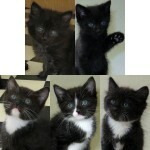 Our “G” litter has two adorable black and white boys: Galahad and Gawain, born 8/5/12. Our “H” litter, born 8/19/12, has two girls: Harmonica and Harlequin, plus their brother Hamlet. All these cats and kittens will be ready for release on or before 10/27/12 – see their full listings on our website’s cat page. Ermine and his 4 siblings were born about 5/25/12, to a stray mama kitty (Cacique, who will also be available for adoption). These kittens came into the adoption program on 7/14, and are being well socialized in a foster home; we expect they will be great indoor or indoor-outdoor kitties (though they should be kept inside until they are a bit older). As of 8/7/12, Ermine is the last available kitten from this litter; those cute, fluffy, NON-BLACK kittens go SO fast sometimes! You need to scoop up this cutie fast, before someone else finds him – he’s just adorable! Suzuki and his sister Bellavista were born 8/18/11, and arrived at the shelter along with their mama-kitty Thea when the kittens were just 3 weeks old. They and mama-kitty are in foster care together, and the kittens have begun the weaning process (at just over 7 weeks old). They will all be spayed/neutered and ready for release any time after October 22. Suzuki is the CUTEST fluffy boy, with some Siamese in his mix giving him beautiful blue eyes, and lovely stripey markings that will probably darken a bit with age. New adoptable pets: Phoebe and the Kittens! Here we have Phoebe and her five practically identical little boy kittens! They were surrendered to the shelter by someone who was no longer able to care for them, and now all are up for adoption. The kittens were born 5/17/11. They are wonderfully socialized, very easy to handle, affectionate, curious, and playful – they will all be great in any type of family. These kittens spent a little time outside prior to being surrendered, so they could probably do ok as indoor-outdoor cats, though would do best as indoor-only cats, at least until they are older. 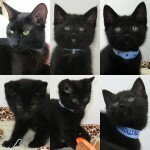 They are all very happy, healthy, and playful – all are litterbox trained and will be ready to go home at the end of July. Mama Phoebe, like all her babies, has a white spot on her throat, and the . . . → Read More: New adoptable pets: Phoebe and the Kittens!